Exams are over. Time for hot chocolate and cozy sweaters. Ahhh! 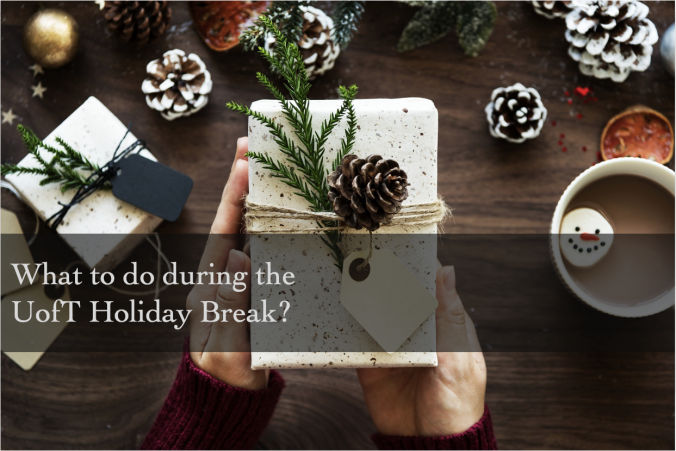 It is so tempting not to think about school while on the holiday break, but it is around the corner. And, for you eager beavers who can’t wait to access your courses, rest assured, I’m here to help you prepare for the new year! Wondering when Courses will be available? For all the students who eagerly wait for courses to be available for the new semester. Logging into Quercus on a daily basis to look for new course tiles on your dashboard. You don’t need to fret, courses will be available when your instructor chooses to make it public. And every instructor is different. You can also look under Courses for the All Courses tab where you can see the classes ROSI has registered you are enrolled in. To learn more you can read: “Course Availability“. Looking around your course but then you get an Unauthorized Message or Page Not Found and get prompt to send a comment. Instead of sending a comment, learn why you’re getting an error before taking action. You can find a quick solution, going from doing nothing to sending an email to your instructor. To learn more you can read: “Unauthorized Message? Page Not Found? Here’s What To Do!“. If you are having any issues with your course, contact your instructor first, they should be the best person to assist you with course related issues. However, if you are having technical issues you should contact your campus Help Desk. So technical issues would be related to: UTORid, email, internet access, wireless connectivity, etc. Not getting Notifications on your device? You have setup your notifications to get them on your phone but for some reason you aren’t receiving them? The reason you aren’t receiving them is because there is an issue with the push notifications on the mobile app. It is not a reliable place for checking notifications, so I suggest checking your U of T email for notifications. Can’t send a message to your peers? You’ve sent an inbox message to one of your classmates, but they say they never received it? Well that is true, your classmates won’t receive your inbox message. This is because U of T has turned off this feature because of privacy issues. If you wish to contact your classmates you can ask them for their email address. Remember they DON’T HAVE to give it to you. To learn more you can read: “Inbox Tool: Student View“. Want to send a message to your Instructor/TA? Click on Inbox and get started in composing a message to your Instructor/TA. You need to find the course. From there, start writing your message. Just make sure your instructor/TA wants messages/questions to be sent to them through the Inbox tool! To learn more you can read: “Messaging the Instructor“. Want to CUSTOMIZE your Profile? There is a few things you can do with your profile on Quercus. If you go into Account and click on Profile, you’ll see all the information you can add about who you are. You can add a photo, write a small biography, and add more contact information. Just know that your instructors and TA(s) as well as your peers can see this information you put there. So remember to be professional! To learn more you can read: “How to Change or Update your Profile in Quercus“. Want to take advantage of the holiday break and learn more about making Quercus work for you! Turnitin: How to get Turnitin to work for YOU! Grades: How do I view my Grades?